• Standardized protocols and experimental design to enable quantitative interoperability of data between groups. Protocols will be deposited into Protocls.io and linked to the BICCN repository. • Standardized definition of each of the different data unit types and level. • Inventory the number and size of each of the different data units. • Common coordinate frameworks for standard and effective data mapping. • Standardized file formats to enable efficient data sharing. • Minimal meta-data to enable data re-use. • Application of controlled vocabularies. • Define requirements for R24 submission pipeline and validation tools. Standards specifications and documents will be made available as they are developed. Later phases of the standardization effort will be centered around feature definition and feature computation for the Integrated Data Set (IDS), involving cross linkage of data sets for cell types specific comparisons. 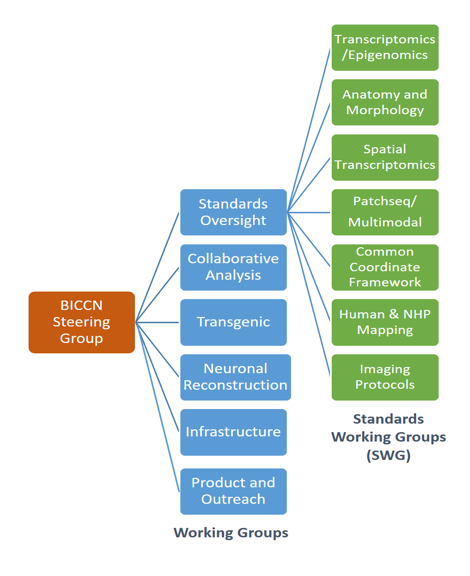 The working groups in BICCN cover topics from management of transgenic lines, neuronal reconstruction, and infrastructure. Special Standards Working Groups (SWG) span the core set of activities that require accurate documentation in protocol, metadata, and feature description. Activities of the SWGs include write up of all protocols across laboratories for comparison and future reference for analysis discrepancies. Another key charge is in the determination of appropriate features and data resolution relevant to cell type and to be reported to BCDC. Specific activities for each Standards Working Group are summarized below. Comparison of Drop-Seq and 10x methodology and correspondence of signal detection between these approaches. Single-nucleus epigenetic approaches, single nucleus mC-seq, ATAC-seq. Appropriate data archiving, utilization of R24 NEMO, DCP infrastructure and deployment of data. Define common analysis workflows and collaboration between single cell groups. Metadata standards for single cell transcriptomics and epigenetics modalities. Quality control metrics for each modality. The Neuronal Anatomy and Morphology SWG focuses on standardization in anatomic description, ontology, and morphological features to be captured. Description of how morphological data is produced and write documentation. Definition of comprehensive, directional and quantitative 3D atlas of long range neuronal connections. Identification and description of projection targets. Minimum metadata standards for morphology. Description of multiple labeling strategies. Sharing morphology issues and challenges in reconstructions. Define level of imaging data that is for BCDC (voxel-level, computation of features, quantification of axons, dendrites. Handing multiple versions of anatomical terminologies. Spatial transcriptomic imaging methods will provide a key to determining the connection between anatomy and combinatorics of cell type. There are many variants of these techniques under development and standardization for BICCN will be key to successful deciphering of cell types. Write up of key protocols and comparison with results generated by alternative groups. Mapping of spatial transcriptomic data to the CCF and the key issues for its use in analysis. Relationship of spatial transcriptomics and scRNA-seq methods. Minimum metadata for experimental use. Quantification issues in transcript identification. Methods and protocols for cross modality association. Variance and accuracy measurements in mapping associations. Reconciliation with single modality measurement protocols. Checking accuracy of transcriptomic mapped data. Spatial coordinate systems, global vs local structures. Protocols for mapping single cell data in the absence of imaging context. Metadata necessary for accurate cellular and image mapping. Descriptions of the CCF and how IDS users interact with this resource. Registration methodology for imaging data including whole brain and slice data. Distinctions in CCF for mouse, non-human primate, human and proposed roadmap. Versioning and change logs that document differences in delineations across versions for backwards compatibility between CCD versions. Data mapping issues, common coordinate identification for these data types. Human slice physiology, standardization and metadata. Develop standardized methodologies for human scale characterization and mapping. Comparison of the marmoset work with the Brain/MINDS project of Japan. Documentation of all imaging methods and approaches, including image processing workflow for anatomic data sets. Detailing of fMOST protocol and other precision imaging approaches and its mapping to the CCF v3. Description and standardization for cell counting approaches.